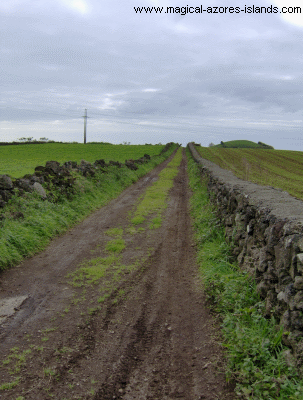 Visiting the back country of Sao Miguel Azores can be a very interesting experience. It gives an appreciation for the natural beauty of the island and for how hard it was to settle the land from the time it was discovered in the 1400's. For me, it is especially good because the Azores are a part of my heritage. I find it very interesting seeing how the farmers live and getting an appreciation for life on these remote islands over the past few centuries. On a recent trip to Ribeira Grande we got off the highway half way there from Ponta Delgada and took a trip to the back country of Faja de Cima. This is where my great grandfather once operated a farm. A short while later we were slowing down in front of the lane way that led to great grandfathers field. Since we were there we decided to take a drive up the little, under improved and underutilized lane way to access several of the farmers fields. About halfway up I got out of the car to snap a couple pictures. The first is towards my great grandfathers old farmland. It is the area going up the hill between rows of hedges on either side. It runs from the bottom of the hill all the way to the top of the hill where you see the trees. These next two photos were taken from the same spot, just facing in the opposite direction on the lane in. 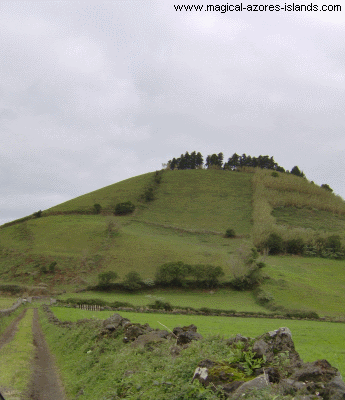 You might be wondering why there are so many walls in the back country of Sao Miguel Azores. The explanation will give you an idea of how hard it was to settle these islands. You see, the walls form two purposes. The first is they allowed for a place to put all the rocks in fields, and the second is that they provided a fence to keep cattle in, and uninvited guests out. A second word of warning, expect it to take some time to find your way around. If you have only 15 minutes, don't go into the back roads, they are rarely marked. Also, if you do get out of the car to have a look (and why wouldn't you?) be sure to remember that the fields behind the walls are someones property. And in some cases there will be a dog guarding the field. You won't have a problem if you remember that if you go onto a property uninvited, there might be a dog there to protect its territory. 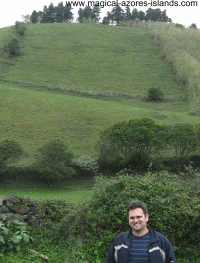 That said, I have never had an issue with a dog in the Azores.